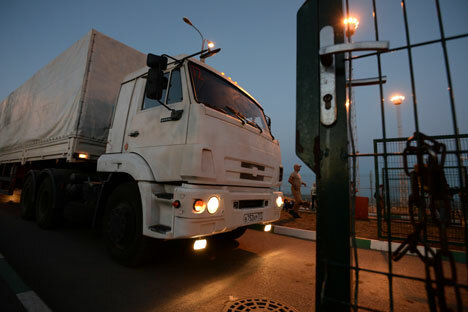 A truck carrying humanitarian aid for people in southeastern Ukraine at the Donetsk checkpoint, August 2014. Russia has delivered nearly 60,000 tonnes of humanitarian aid to southeastern Ukraine since 2014, Russian Deputy Minister of Emergency Situations Sergei Voronov has said. "In the period between August 2014 and now, the Russian Emergency Situations Ministry, jointly with interested Russian federal and regional executive authorities, charities and other organizations delivered humanitarian aid to the Donetsk and Luhansk republics," Voronov told the Federation Council Committee of public support for people in southeastern Ukraine on Feb. 25. "In all, to date, we have sent 49 columns of vehicles which delivered over 59,000 tonnes of humanitarian aid," he said. This included food and medications, in particular, he said. Over 4,000 tonnes of the aid delivered by the ministry had come from 77 public organizations. The ministry also helped fast-track the customs clearance of over 30,000 tonnes of humanitarian aid delivered by public organizations themselves, Voronov said. "This year, one column was delivered that included food supplies, firefighting equipment, fire hoses, emergency rescue tools, equipment and so on," the deputy minister said. The ministry has also organized joint work with the Russian health ministry and Fair Aid, an international public organization, to evacuate seriously ill Ukrainians to Russian hospitals. "Yet another sanitary evacuation - of 24 seriously ill children - was carried out on February 5. In all, 248 children have been delivered to Moscow clinics from southeastern parts of Ukraine's Donetsk and Luhansk regions," Voronov said.